The best time to visit San Francisco is in the fall (September through November) when the city's “Indian Summer” sets in and kids have returned to school, making for some of the city's warmest weather and cheaper all-around prices. 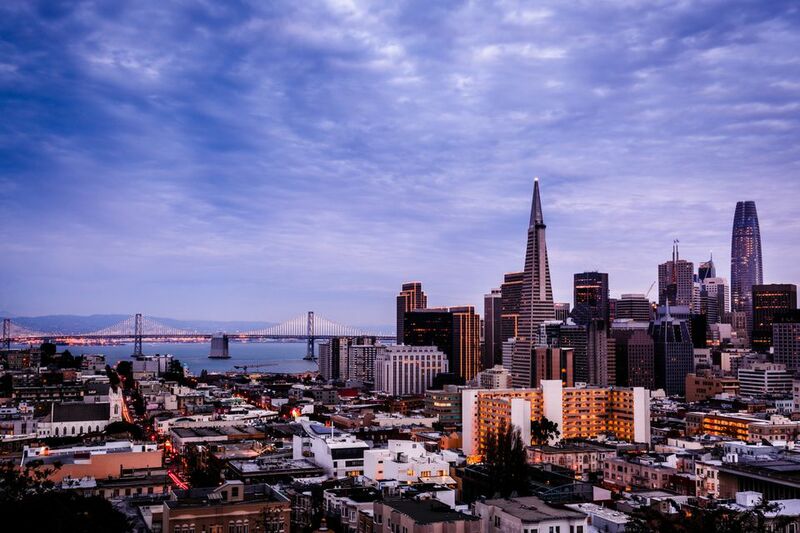 Still, whenever you plan to explore San Francisco this handy guide will navigate the city's unusual micro-climates and discover some of its most exciting events and festivals. Get ready to enjoy San Francisco at its best. Don't let the moniker “summer” fool you. June through August can be some of San Francisco's coldest months, with the city's renowned fog rolling in and quickly dropping temperatures, making layers a must. The rainy season typically runs from late November through April, though May and June are often quite misty. March and April usually offer a stretch of warmer weather, but September and October are traditionally the city's warmest months, with blue skies from the bayside to Ocean Beach. Despite the cool weather, summer—and spring break—remains a popular time to visit San Fransisco and crowds are at their peak. While the greater Bay Area pours into the city for the holidays, many local residents actually head elsewhere to celebrate, evening out crowds and making the week between Christmas and New Year's an excellent time to visit. Insider tip: San Francisco completely empties out during Nevada's annual Burning Man festival (end of August/beginning of September), opening up parking spaces and attractions. Most museums close one day a week, typically Monday. For the most part, prices in San Francisco are lowest in winter, when temperatures drop, the rain sets in, and crowds thin out, though both the cost of airline tickets and lodgings can fluctuate drastically when there's a conference in town, most notably the Salesforce Dreamforce Conference in late September. If prices seem otherworldly, try booking a week back or ahead. Although San Francisco's weather may change drastically from one day and neighborhood to the next, there are some things that remain constant. Winter is a great time for indoor events like Sketchfest—the city's premier comedy festival—and to experience some of the city's best bars and restaurants, while street festivals take over during summer months. October offers a bevy of events to choose from, including the city's annual literary festival and Hardly Strictly Bluegrass, a three-day, six-stage, completely free music festival in Golden Gate Park. January is a part of San Francisco's off-season, when temperatures are often at their coldest and residents are still recovering from the December holidays. It's often rainy, though you can get perfectly clear, dry days as well. Perks include minimal crowds and cheaper lodgings overall (unless there's a conference). The city's annual SF Sketchfest comedy festival seems to grow in both hilarity and big names each year. Past events have included everyone from Jon Hamm to Canadian sketch comedy troupe The Kids in the Hall. More than 100 eateries citywide (including popular spots like Waterbar and Flour + Water) offer special prix-fixe menus during SF Restaurant Week, making dining out in this bayside city an even bigger treat. Typically still cold and rainy, February also means lesser crowds and lower costs—though rates may rise during the annual Chinese New Year celebration. It's also the month in which San Francisco's ornamental cherry trees usually start to bloom. Beer-centric events reign during SF Beer Week, meaning a plethora of curated beer and food tastings, talks on home-brewing, and special guest beers at neighborhood brew pubs. The largest Chinese New Year parade outside of Asia takes place in San Francisco: an illuminated night extravaganza that first began in the mid-19th-century. Associated events include a flower market fair and Miss Chinatown U.S.A. Pageant. Winter's rains continue and days can often be quite windy, but temperatures often improve and flowers like trumpet honeysuckle and sunflowers start to add a bit of color. Rates on rooms also begin to rise. Celebrate the luck of the Irish with San Francisco's St. Patrick's Day Festival and Parade, the biggest Irish celebration on the West Coast—complete with live bands and arts and crafts. Colorful flowers, trees, and plant transform downtown's Union Square during Macy's Flower Show, an annual tradition for nearly 75 years. The weather starts to warm, rainy days are fewer, and the city starts springing to life before the inevitable fog rolls in. Expect rates to go up a bit more—but it's still a good time to visit. Spring-centric festivities are par for the course, and depending on the year may include the Union Street Easter Parade & Spring Celebration—complete with its own bunny hop. The annual St. Stupid's Day Parade, which promotes silliness, is an April 1st given. Indoor events range from the modern and contemporary artworks of Art Market San Francisco to the city's landmark International Film Festival, showcasing approximately 200 films from more than 50 countries. Temperatures remain mild, averaging in the mid-sixties, though days are drier and often clear. However, the city's notorious “Karl the Fog” has been to known to make a May appearance—sometime sticking around for days at a time. Despite the uneven weather, by May, San Franciscan's are ready to start stripping down and letting loose. It's a theme that's most apparent during the city's annual Bay to Breakers: a just-over 7-mile foot race from the bayside Embarcadero to Ocean Beach. While there are some serious competitors, most of the “running” is done in elaborate costumes or often nothing at all—and in many cases inebriated. It's a definite sight to behold. Held in the city's multi-cultural Mission District, San Francisco's decades-old Carnaval celebrates the neighborhood's diverse Latin American and Caribbean roots with hip-shaking music and dance, vibrant costumes, and a Grand Parade. Fog starts rolling in on a regular basis, leaving many of the neighborhoods closest to the ocean covered in a white blanket of “brrr” that covers the sun, while other parts of the city—such as downtown and the Mission—have blue skies and spring-like temps for much of the day. Either way, it's not your typical summer. Still, street fairs are in full swing and families flock to the city, taking full advantage of their kids' school vacations. Room prices rise accordingly. San Francisco is known for its festive street fairs, and the best month to experience them is June. Sample craft wine and beer at the long-running Union Street Music Festival, with performances from two-dozen live bands; peruse handmade jewelry and tie-dyed wares at the Haight Asbury Street Fair; and wander the back alleys of San Francisco's “Little Italy” at the two-day North Beach Festival, one of the country's original street fairs. An absolute must-do, the annual LGBTQ Pride celebrates the city's wonderful diversity with a grand parade and two days of all-out festivities, including plenty of music and dance. The fog has settled in and the city experiences cool temps and weather that can change from warmish to downright frigid in an instant. Remember: San Francisco is a city of microclimates. Bring layers, and despite the chill, expect crowds. San Francisco's chilly summer weather means July is a great month for indoor activities, including film festivals. Notable ones this month include the San Francisco Jewish Film Festival and the San Francisco Frozen Film Festival, highlighting indie films, live music concerts, and documentaries. The city's annual AIDS Walk has raised millions of dollars since its 1987 inception. Join thousands of others making a difference on two feet. San Franciscans are pretty much over the seemingly endless fog, which continues to retract late and roll back in early, leaving a small window of time to endless warmer temps and sun. Still, the summer crowds continue. Since its 2008 beginnings, Outside Lands has morphed into one of the Bay Area's most beloved music and arts festivals—featuring headliners from Paul McCartney to Metallica over the years. Bring a parka and gloves: the three-day outdoor event takes place in Golden Gate Park, where temps drop quickly. September is one of the best months to visit San Francisco, as Karl the Fog starts to dissipate and the sun begins to shine, making for warmer temps and the start of San Francisco's “Indian Summer.” Crowds start to lessen as well—except during the annual Salesforce “Dreamforce” conference, when lodging prices also go through the roof. Not for the faint of heart (or children), the Folsom Street Fair happens to be the world's largest leather event. Expect chaps, whips, and lots of skin exposure. Enjoy a random array of independent and offbeat theatre at the San Francisco Fringe Festival, with upwards of 100+ performances held over a 10-day period. There's no better month to visit San Francisco then October, with its warm weather and a host of exciting activities and events citywide. Even lodgings are (relatively) affordable, and the local energy is unbeatable. When San Francisco billionaire Warren Hellman decided to start a free music festival in Golden Gate Park back in 2001, no one knew how big it would become. With six stages and dozens of performances, the three-day Hardly Strictly Bluegrass (HSB) festival attracts all walks who come to picnic, dance, and simply listen to good music. Acts like Steve Earle, Emmylou Harris, and Alison Krauss are perennial favorites. Litquake is the city's beloved literary festival, 10 days of storytelling, readings, “in conversations” with, and a “literary pub crawl” held at venues across the city. You'll know its SF Fleet Week when the Blue Angels acrobatic flight team start roaring their engines overhead. Along with their death-defying show, festivals include ship tours and a parade of sea vessels. Rain starts moving in and temperatures begin to drop, but prices remain low. Crowds lessen as even San Francisco residents head out of town for the beginning of the holiday season, freeing up attractions and making the month a perfect time to visit. Commemorate the lives and legacies of departed loved ones at Dia de los Muertos, a festival of altars held in the city's historically Latino Mission District. A bevy of large-scale installations light up the night citywide at the annual Illuminate SF Festival, which starts on Thanksgiving and runs evenings through New Year's Day. The holiday season is in full swing, and visitors flock to the city for its light displays, ice-skating, and shopping. Temperatures continue dropping and SF can get downright cold. As expected, prices spike a bit as the holidays draw nearer. It's the season to celebrate in San Francisco, from two-story gingerbread houses to Nutcracker performances. The Union Square Ice Rink is an annual holiday tradition, as is the Great Dickens Christmas Fair, a throwback to Victorian London complete with roasted chestnuts, costumed carolers, and plenty of handmade wares for purchase.